…Make sure your company is seen. 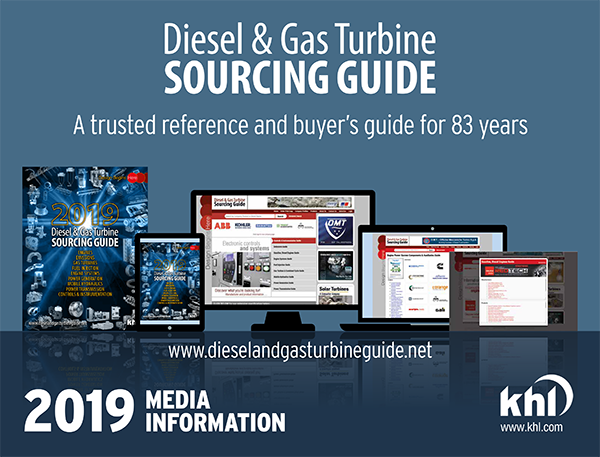 Advertise in the 2019 Diesel & Gas Turbine Sourcing Guide and on Dieselandgasturbineguide.net. Because Diesel & Gas Turbine Sourcing Guide and Dieselandgasturbineguide.net, offer a unique Internet-Print package highlighting nearly every kind of component used in reciprocating & rotating engine-powered systems and equipment. Diesel & Gas Turbine Sourcing Guide and Dieselandgasturbineguide.net are organized by product concentrations. They offer a broad, yet highly-focused reference for engines and engine system components complete with product specifications — searchable/comparable online — for many concentrations. For more than eight decades, engineers and buyers have started with the print edition of the Diesel & Gas Turbine Sourcing Guide as the primary reference for specifications and details on all of the components that go into engine systems. It remains the “original search engine,” guiding nearly 10,000 users in more than 90 countries to your products and technologies. Dieselandgasturbineguide.net delivers a high-quality audience. delivers a unique integrated, global marketing platform, for one low package price. For more information, contact our Publication Manager or one of our global offices.